BarkingWife Blog: Husbands Say "I Love My BarkingWife!" Over the last few months, I had decided to give him a break from receiving Reminder Phone Calls from www.BarkingWife.com. I figured that since he had been getting calls off and on for over a year (all during the development phase of the website) that he was probably tired of getting them but too polite to say anything. However a few days ago, I hit my limit with him saying, “Remind me later to…. (fill in the blank)”. Every time he says this to me, it is like them putting the responsibility on me. Now, if I forget to remind him to do whatever, it’s my fault, not his. What I want to say back to him is “Remind me later to remind you.” There!! Now the responsibility is back on you. The monkey is back on his back (where he is supposed to be anyway) and not mine. Even though, when I have actually said this in the past it feels good, the results are usually not successful. So, what I decided to do was to sit down at my computer and set up some Reminder Calls to Bryan. It was so quick and so easy. It only took about five minutes. Schedule “Personalized Calls” to remind Bryan every 5 months for the next 2 years to change the air filters in the attic. Schedule another” Reminder Phone Call” to call Bryan’s cell phone on February 7th to remind him that Valentine’s Day is one week away and that he needs to start making some plans. Schedule a “Reminder Phone Call” to call him on February 14 to remind him that it’s Valentine’s Day. And I scheduled one more “Personalized Call” that he would get from me while he was sitting in traffic on his way home that told him how much I loved him. Before you give me grief about the last one and ask why I didn’t just call him myself and tell him how much I love him, it’s because usually when he is sitting in traffic getting to listen to his favorite music in a comfortable car, winding down from a day of work, I am trying to get two rambunctious children fed dinner that they probably don’t want to eat, the dogs fed without them getting into a fight, the children into and out of the bath with the least amount of water everywhere, children into pajamas, prayers said and down to bed , the kitchen cleaned up, and the house picked up so it doesn’t look like a tornado had hit it (Wow! Just writing that sentence made me tired). So when he is sitting peacefully in traffic on his way home, I’m not usually feeling all lovey-dovey at the moment. If I were to call him during this time, the message would be something more along the lines of, “I don’t care if you have to drive in the grass on the side of the freeway to get home, you better do it and make it fast”. So, when Bryan got home that night he said to me, “Thanks for my reminder calls. I really missed getting them.” At first I didn’t react because I wasn’t sure if he was being sarcastic. But he was totally serious. HE HAD MISSED GETTING THEM! A few times in the past, when I’ve told women about www.BarkingWife.com and all the Reminder Phone Calls that are available, ever so often one of the women will say, “My husband would kill me if I sent him phone calls to remind him to take out the trash each week.” The truth is, he may actually love getting them because they are way better and more fun than being nagged to take the trash out every week! And if you stop the messages, he may actually miss getting them like my husband did. Go figure! 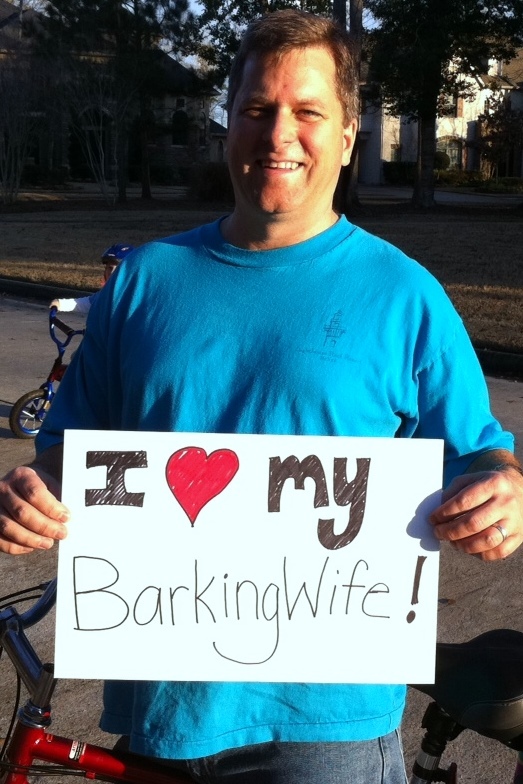 It was a good lesson for me to learn and reaffirmed why I love this business and why my husband love’s his BarkingWife too!